Historic districts are appealing for many reasons—the unique homes, established trees, and their proximity to downtown to name just a few. Another small appeal is the lack of HOAs (home owner associations) which come standard in newer Phoenix real estate developments, complete with rules and monthly fees. Yet there is one surprising exception: the one-of-a-kind Idylwilde Park Historic District just off 12th Street and a bit north of Osborn Road, is an HOA. Although you might never know it unless you’ve cruised overhead via aerial mapping, the homes in Idylwilde back onto their own private 3-acre park that’s lined with a double row of mature Tamarisk trees and contains a community pool. Each home in Idylwilde Park Historic District (there are about 40 of them) owns an interest in historic Idylwilde Park. The Idylwilde Park Club HOA shares maintenance expenses for pool, park and water that generally amount to a few hundred dollars per homeowner per year. Idylwilde is, in some sense, more like a modern suburban Phoenix neighborhood than an urban one. With less personal outdoor space than the typical downtown lot (most homes in Idylwilde have shortened backyards since the park is right there to extend the outside space) and more shared community space. But it is totally unique in that the homes don’t face a central park; they hide it away from the public making it truly private for Idylwildians. The developers of Idylwilde boasted that each home was different from the next, both in home style and in interior details like fireplaces or libraries. These 1920s or 30s homes are quaint Period Revivals in the English Tudor, Spanish Colonial Revival or Bungalow style, with an original footprint of about 1200 square feet. If you’re looking for historic charm, and want the modern luxury of a pool (but don’t want the responsibility of cleaning one year-round! ), Idylwilde Park Historic District offers a unique lifestyle in historic central Phoenix that is definitely worth checking out. 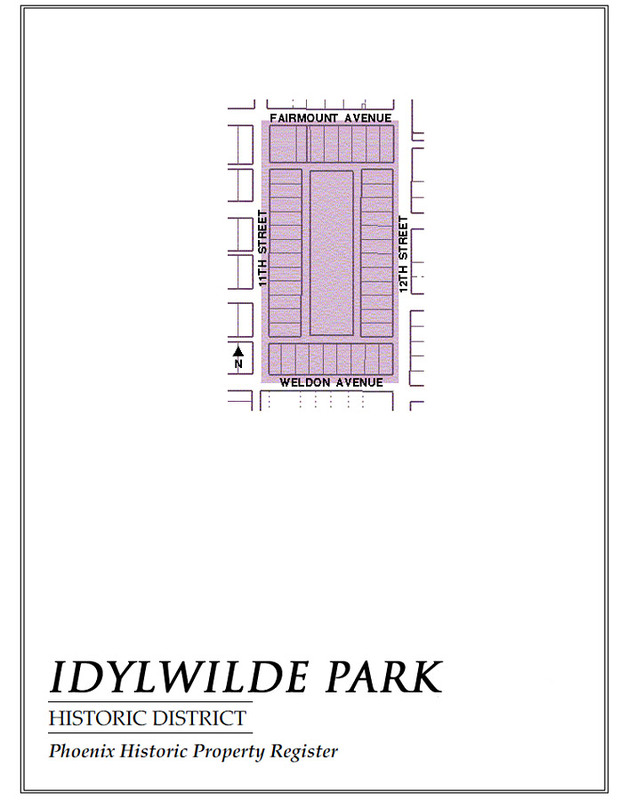 Current news and past history of the Idylwilde Park neighborhood.